Info "Hey! Don't let them hit the ground!" Helping Hand is one of Young Cricket’s Microgames in WarioWare: Smooth Moves. A valuable fragile object or baby will be sliding down a slope. 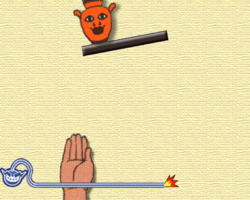 The player has to move their hand to catch it. 1st level difficulty: A vase with a face will fall. 2nd level difficulty: Two men will fall. 3rd level difficulty: Two gymnasts or two boys in umbrellas will fall, but one will fall slower than the other to distract the player. This page was last edited on April 19, 2019, at 21:19.